You might be hesitant to cook pheasant due to its reputation as tough, dry meat. But you can roast a pheasant to tender perfection with the proper ingredients and timing. Young pheasants are typically more tender than older birds. Farm-raised pheasants are usually killed young, making them ideal candidates for dinner. If you hunt for your pheasant, you might be dealing with an older, tougher bird. Roasting pheasants with bacon on top and a flavored stock in the roasting pan can take out any toughness. 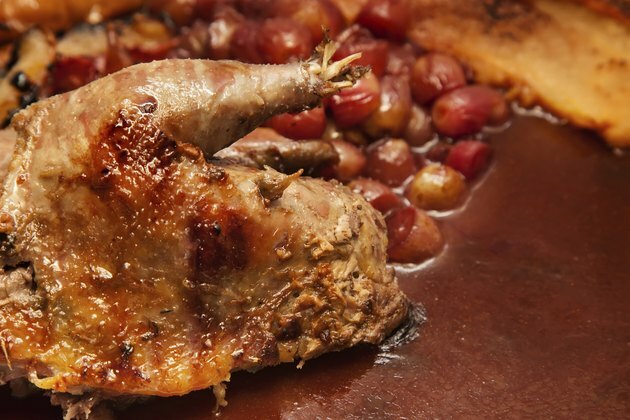 Roast pheasant easy to prepare yet unusual and delicious enough to serve on special occasions. Preheat the oven to 500 degree Fahrenheit. Rinse the pheasants under cold, running water. Pat dry with paper towels. Drizzle the pheasants with olive oil, and massage the oil into the birds. Sprinkle the thyme, marjoram, salt and pepper over the pheasants. Stuff each pheasant cavity with two pieces of the lemon and half of the celery and carrot. Pour the chicken stock into the bottom of a roasting pan. Place the onion, garlic and bay leaf in the broth. Set the wire rack in the roasting pan. Place the pheasants, breast side up, on the rack. Arrange four pieces of bacon on each bird, covering as much of the bird as you can. Place the roasting pan on the center rack of the oven. Roast the pheasants for 20 minutes. Remove and discard the bacon strips. Continue to roast the birds for an additional 30 minutes, or until the internal temperature is 155 degrees Fahrenheit. Remove the pheasant from the oven. Allow the meat rest at room temperature for 15 minutes before serving.